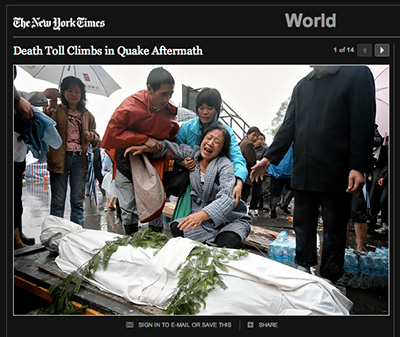 The New York Times has published an excellent photo gallery of the earthquake aftermath in China. If you haven't followed the coverage, there are some powerful photographs here. Image in screenshot by Color China Photo, via Associated Press. To commercialise in terms of quality rather than cost, and in order to differentiate consequently, you necessitate to adopt the standardized format of the 4 Ps marketing plan. That is, Price, Product, Place and Promotion evidently you know the principal attributes of the product, and the price, but for place you should think approximately the type of mass who are willing to pay over 4x price of competing merchandise whereas the low-priced option may be sold where accent is on cost, your ware will be suited to places/distributors where the customers will be willing to pay for high-performance. Thank you for this article! I've just watched a absolutely big news site about real marketing Attempt it!